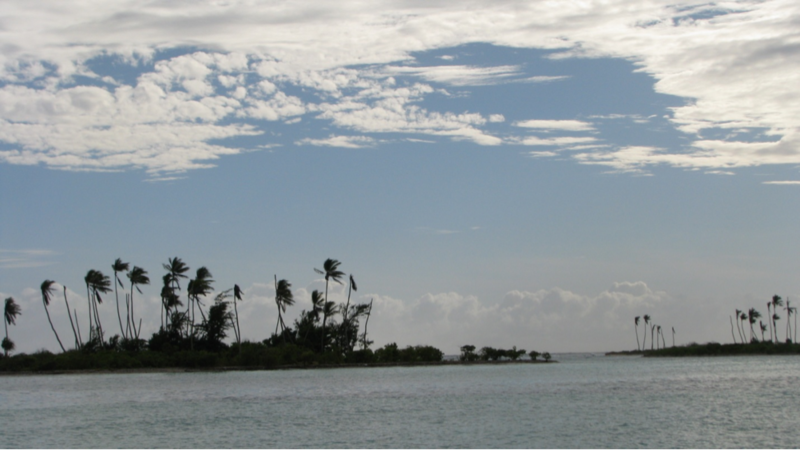 Do island nations have any legal recourse as sea levels rise? This is a guest post from Peter Shelley, a legal consultant to the New England Aquarium on the Phoenix Islands Protected Area initiative since 2005 and Senior Counsel at the Conservation Law Foundation Massachusetts. In this post he shares his insight on the issue of Kiribati and sea level rise due to global climate change. Usually, when your neighbor does something that damages your land through no fault of your own, you can run into court. You can both make the neighbor stop and you can receive damages for the loss of the value of your property. No contest. But what if you are a small island developing state (often called a SIDS) like the Republic of Kiribati that also happens to be low-lying? And your neighbor is the United States and your neighbor refuses to accept that their behavior (CO2 and other greenhouse gas emissions) is causally linked to the fact that sea levels are rising dramatically. Not so easy. 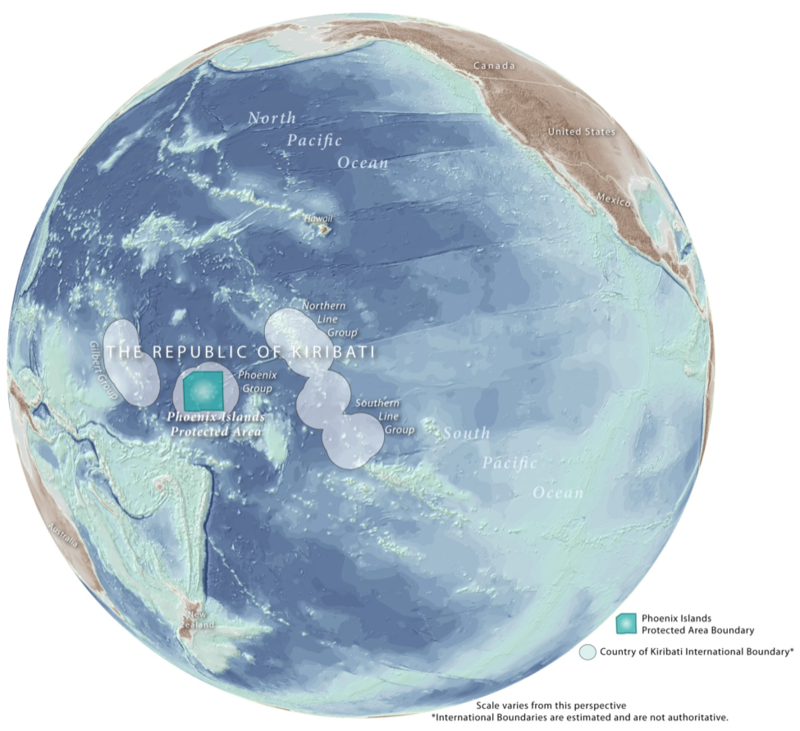 This map shows Kiribati's location in the Pacific Ocean and the boundaries of the Phoenix Islands Protected Area. The magic word here is “baseline.” If one is a country, the baseline is what matters here. The baseline is the line from which all the marine zones adjacent to that country are drawn: the territorial sea (12 nautical miles), the contiguous zone (another 12 nm), the “exclusive economic zone” (EEZ)(200 nm), and the continental shelf (can be as far as 350nm). Kiribati has already lost several islands to sea level rise; are they required to redraw their baseline and yield thousands of square miles of EEZ to the high seas? International law is not ready to respond to the impacts of climate change and rising sea levels. The conventional wisdom (if there is such a thing in international law) is that these zones recede as the baseline recedes. There are other conclusions possible that keep the zones where they are presently set. If you are a country like Kiribati, which is almost exclusively comprised on low-lying atolls, you have the further problem of becoming an international “rock” or even worse: nothing above water. A “rock” is a place in the water that can’t support people or economic activity. Rocks don’t get zones. Unless things change, Kiribati will go under water (except perhaps Kiritimati in the eastern Line Islands). That immediately raises two issues: the people and the property. 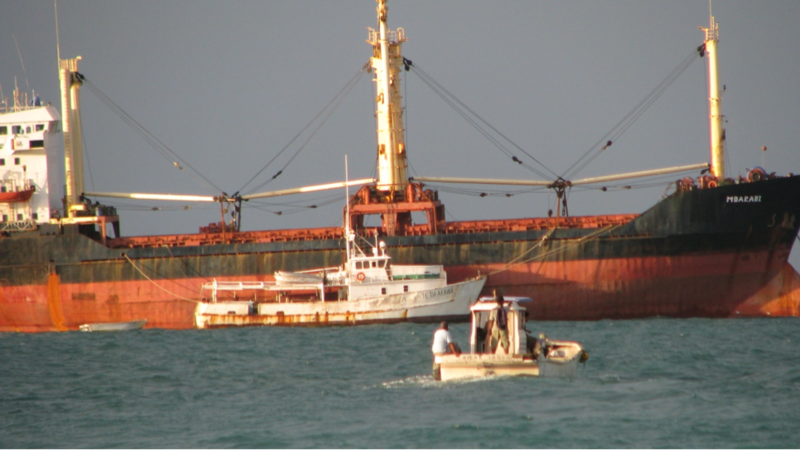 As far as the I-Kiribati are concerned, their legal status under international law is not clear. If they are forced off their islands by the developed/developing world, they technically aren’t entitled to refugee status or protection; there is no political persecution. There is no such thing as a “climate refugee” yet. Ships in Betio port, Tarawa, Kiribati. If they lose their atolls to sea level rise, they no longer have any territory either. There are a couple of territory-less people who have something like sovereign rights but not really. Another Pacific state could theoretically partition themselves to give the I-Kiribati “territory” but that isn’t likely. So, the people are stuck for the moment until a new treaty, treaty protocol, or other legal vehicle is recognized by the international community. Since the US doesn’t officially believe that humans have caused the sea levels to rise, that may be a long wait. Having the moral high ground is not likely to be enough here. And what about the Kiribati territorial sea, contiguous zone, EEZ and continental shelf? No one really can say. Scholars are being scholarly and diplomats are diplomating. But that isn’t going to allow Kiribati to protect its sovereign or economic interests in these areas, not to mention its future rights if, for some unforeseen reasons, sea levels recede once more. Those EEZ interests are the financial life blood of the I-Kiribati people today and going forward. The economic support they provide is the only hedge a "de-territorialized" Kiribati has against the real risks of a complete cultural loss. There won’t be a readily available answer to this issue. The developed world is utterly conflicted on the topic: Kiribati has one of the largest EEZs in the world and exceedingly lucrative tuna fisheries. If the distant water fishing nations do nothing and are allowed to get away with it, they will reap a windfall as the boundaries of the high sea expands. There ought to be a law against this. Thanks Peter. Fascinating. I think we'll use your comments for our "Ocean Change" discussion with volunteers at NEAq next week!